A series of votes on regional autonomy is testing Evo Morales's political project and challenging Bolivians to find new ways of living together, says John Crabtree. The leftwing government of Evo Morales suffered a significant political reverse on 29 June 2008, when an opposition candidate was elected the new prefect of the southern department of Chuquisaca. However, the real clincher is likely to be 10 August; on that day Bolivia's president, his vice-president, and eight other departmental prefects will face voters in a "recall referendum" on the country's national and regional executive authorities. The rightwing opposition to Morales has so far been concentrated in the lowland departments of the east, the so-called media luna ("half-moon") made up of Santa Cruz, Tarija, Beni and Pando. The capture of the prefecture of Chuquisaca, where the ruling Movimiento al Socialismo (MAS) won by a large margin in the 2005 elections, shows how effective the discourse of "autonomy" can be in undermining support for the central government. Until 2005, the office of prefect had been a central-government appointee, responsible - essentially - for law and order. The election of prefects for the first time that year changed their status, giving the office much greater visibility and legitimacy. The full implications of this were largely lost on the MAS in 2005, whose efforts went more into selecting candidates for the chamber of deputies and the senate than for prefects. In those elections, held at the same time as the elections for president and congress, the MAS candidates won in only three departments, Oruro, Potosi and - significantly - Chuquisaca. The election of Savina Cuéllar, the opposition candidate, as the new prefect therefore represents an important incursion into what would normally be considered a MAS heartland. It also means that the number of departments demanding autonomy is now in a majority: five out of nine, as opposed to the media luna quartet. Cuéllar, a former MAS supporter with a long track-record of working with the indigenous women's movement, had strong electoral credentials. The early unofficial figures suggested that she had won by 55%-40% against the official MAS candidate, Walter Valda; on 2 July, the definitive results released by the electoral authorities showed a closer outcome of 51.58%-44.17%, with the remainder going to the small Alianza Social (see "Cuéllar es Prefecta con 51%", Correa Del Sur, 2 July 2008). The opposition camp has been able to make the running in a series of local referenda over autonomy in the last two months. These began on 4 May in Santa Cruz, and were followed up by polls in Beni and Pando (on 2 June) and in Tarija on 22 June. The referendums asked people to approve "statutes of autonomy", drafted by local officials and members of civic committees. These varied in their details from one department to another, but the general drift was to proclaim de facto independence from La Paz over a wide range of administrative areas. The government, for its part, claimed that the referenda were illegal and that the autonomy statutes represented a gross violation of the constitution. The National Electoral Court, the body constitutionally responsible for running elections in Bolivia, refused to involve itself in these contests, though its regional organisations ignored instructions from La Paz and held them regardless. The international community - in particular the Organisation of American States (OAS) failed in its attempts to broker talks between the four eastern departments and the government to resolve the issue prior to it going to a vote. A group of "friendly" countries - including Argentina, Brazil and Colombia - was equally unable to break the deadlock. Unsurprisingly, those voting "yes" to greater departmental autonomy outnumbered those voting "no", by as much as four to one. However, large numbers respected the government's position that they should abstain from voting, particularly in areas where the MAS is strong. Behind the issue of departmental autonomies is a deeper conflict between a leftwing government and its opponents over the whole direction of the former's agenda for change, in particular to constitutional reform. The MAS, elected in a landslide victory in December 2005, was committed to a radical reform agenda, including the rewriting of the existing (1967) constitution to make the political system more representative of the country's indigenous population. An elected constituent assembly began its work in Sucre in August 2006, but the MAS's proposals were consistently harried by the opposition, whose strength in the assembly was sufficient to hold matters up. The assembly's final sessions were boycotted by the main opposition group, Podemos, which refused to acknowledge the legitimacy of the proposed constitutional text. The "statutes of autonomy" were first announced on the very day that the text was formally handed to the government. The statutes were designed to be wholly incompatible with the draft constitution. There are further key areas where the ruling MAS and the opposition are divided. They include the opposition's hostility to a programme of land reform in eastern Bolivia which would impose limits on private landholding in certain circumstances. and the way in which the income derived from taxes on gas output is divided up between the departments. The producer departments - notably Santa Cruz and Tarija - argue that they should receive more benefits from the gas rents, irrespective of the interests of other, poorer parts of Bolivia. The issue which first led to the turnaround in support for the MAS in Chuquisaca is what has become known as capitalía plena, the claim by Sucre - the administrative capital of Chuquisaca - to be restored to its status as Bolivia's rightful capital city. When Bolivia achieved independence from Spain, Sucre - then known as Chuquisaca - became its capital. However a bitter civil war in 1899 between Sucre and La Paz led to the latter being proclaimed the "seat of government". Since that time, the executive and legislature have been based in La Paz, with the supreme court sitting in Sucre (see "Bolivia: a tale of two [or rather three] cities", 18 September 2007). It was the violent anti-government demonstrations over the issue of capitalía that forced the constituent assembly to abandon the city of Sucre in its final sessions. The civic committee in Sucre, spurred on in part by its counterpart in Santa Cruz, emerged as the driving force behind anti-government protests. In the process, David Sánchez, the MAS prefect, was obliged to abandon the city, finally succumbing from exile in Peru to demands that he resign his post. After a period when an interim appointee was in place, the election on 29 June was held to find a successor. In the wake of the four media luna referenda on autonomy, the civic authorities in Sucre are now intent on pushing forward with their own autonomía, over and above the city's demands for capitalía plena to be recognised. Here their demands are arguably less well-founded than those of their media luna counterparts. In a referendum that the assembly make proposals for autonomy for those departments voting "yes", Chuquisaca (in common with the rest of highland Bolivia) voted "no". The MAS at the time led the campaign for a "no" vote, with only Santa Cruz, Tarija, Beni and Pando voting "yes". To add to the current plethora of referenda, Bolivia as a whole is to hold a recall referendum on 10 August 2008. Both Evo Morales and vice-president Alvaro Garcia Linera will ask voters to reaffirm the confidence expressed in them at the ballot box in December 2005. The likelihood of them being voted out of office is small. For this to happen, the opposition would have to rally at least 54% in support of a "no" vote, the margin by which Morales and García Linera were elected in 2005. 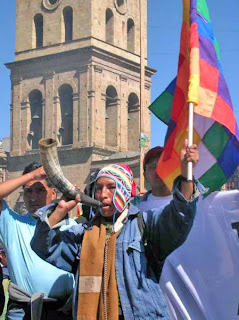 Public opinion in Bolivia as a whole is well disposed towards their first indigenous-born president, even though Morales's support in eastern Bolivia has slipped as a result of the campaigns over autonomies. More at risk, however, are the eight prefects (all except Chuquisaca) who will also have to submit themselves to recall. In each case, they were elected by smaller margins than Morales and García Linera, and therefore will need to rally more support to stay in office. The most recent polls suggest that a majority of prefects may lose their positions; if so this will be a blow to the opposition which has employed its control of these elected positions to further its cause and give itself valuable political exposure. Those with the greatest chances of losing are José Luis Paredes, the Podemos prefect of La Paz, and Manfred Reyes Villa, the opposition prefect in Cochabamba. Mario Cossío in Tarija may also be at risk. However, the opposition is now pushing for the rules to be changed so that "50% plus one" is enough to be ratified in office; success in this endeavour would change the political calculations. The recall referendum - ironically the result of an opposition initiative in congress - thus provides Evo Morales with an important opportunity to turn the tables on some of his key adversaries, while enhancing his own legitimacy if he proves able to increase his 2005 margin of victory. He has now started active campaigning for 10 August, hoping to capitalise on pro-government sympathies in the most populous parts of the country, particularly in rural areas (see Carlos Macias, "Electoral rifts in Bolivia", Council of the Americas, 26 June 2008). Whatever the result of the recall referendum, the deep divides that bedevil Bolivian politics are set to persist, placing further strain on the country's weak democratic institutions. A victory on 10 August would reaffirm the government's resolve to push ahead with its chosen agenda, particularly with regard to holding yet another referendum this time to ratify the new constitutional text. For its part, the opposition may feel obliged to resort to ever more audacious plans to thwart the government and its policies. The battlelines will therefore be drawn for further conflicts to come.